LIFETIME WARRANTY(see salesperson for details)!, SERVICE RECORDS AVAILABLE!, PASSED - Multi Point Dealership Quality Assurance Inspection!, NEW BRAKES!, RECENT TRADE IN!, AWD, BLUE TOOTH HANDS FREE, REAR BACK UP CAMERA. Odometer is 40293 miles below market average! CARFAX One-Owner. 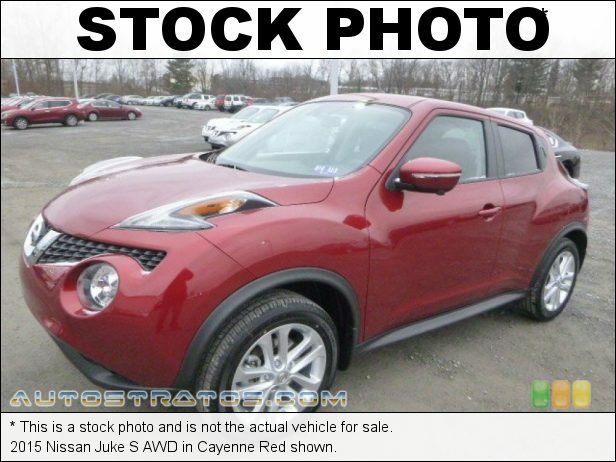 Cayenne Red 2015 Nissan Juke S 4D Sport Utility AWD CVT with Xtronic 1.6L I4 DOHC 16V 26/31 City/Highway MPG Enjoy the benefits of a lifetime powertrain warranty on all pre-owned Acura, Honda, Hyundai, INFINITI, Kia, Lexus, Nissan, Subaru, and Toyota vehicles with less than 55,000 miles on the odometer that are 5 years old or newer. Speak with one of our customer friendly Sales professionals for more details. Warranty coverage like this can only be found at Dan Perkins Subaru of Milford! Visit us at www.danperkinssubaru.com, or call us at 866-979-1012!